The original meaning of “rev” is “to increase the RPM of an engine,” but it is also used to express “stoking excitement.” Based on this nuance, Yamaha CEO Mr. Hiroyuki Yanagi said, the slogan is “a statement of the desire to provide value and emotional experiences that surpass customers’ expectations” – the driving theme behind the design. 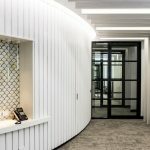 The two-storey office space features a combination of offices and open plan workstations, with a series of meeting rooms and collaboration spaces for employees and guests. The space balances softness and warmth with explosive rhythm and pulses to create opportunities and memorable experiences that get the heart racing.